The storm established many records and near-superlatives. It was arguably the greatest natural disaster ever to hit New England, killing some 800 people (and injuring that many more), destroying or damaging nearly 60,000 homes and structures, producing losses in the neighborhood of $300M. (That might translate into $4.5B today based on inflation alone; but given the buildup of population and property over the intervening years, a similar storm might produce more like $40B in damage and economic disruption.) It was stronger than any storm to hit the area with the possible exception of the great colonial hurricane of 1635. The storm hadn’t been well tracked, and made landfall at a speed of some 70 mph. (Long Island residents were particularly unprepared.) 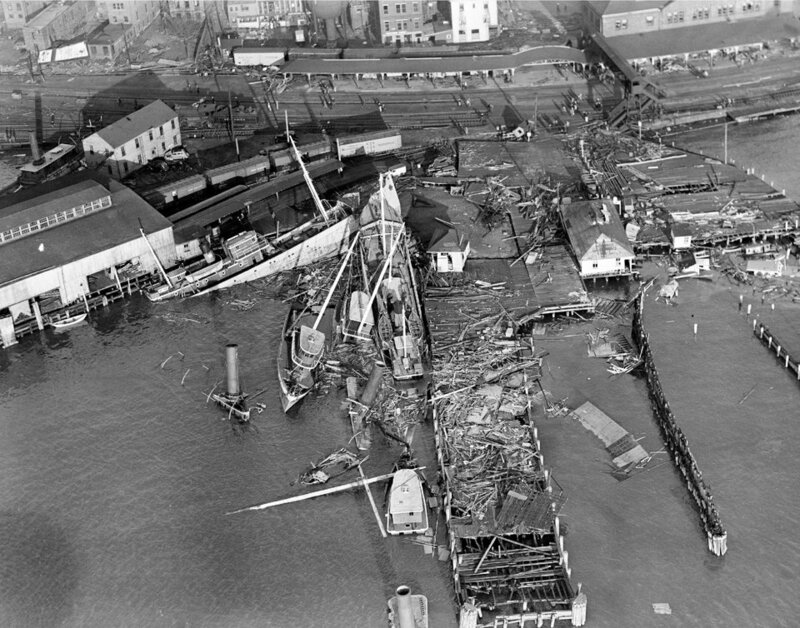 The storm surge reached heights of 20 feet or more in some areas, destroying much of Providence and other coastal cities, breaking coastal train lines and roadways. It rearranged the New England coastline, obliterating some historic features and creating new ones. To mark this anniversary, the AMS has released a new book, recounting the science and impacts of the storm: Taken by Storm, 1938: A Social and Meteorological History of the Great New England Hurricane, by Lourdes B. Avilés, an associate professor at Plymouth State University in New Hampshire. You can order it at the AMS Bookstore here. Ken Heideman conducts and extended interview with Ms. Avilés on the book on the AMS blog, The FrontPage; if you have the time, you’ll learn a lot by following their conversation. Ms. Lourdes tells the story with enthusiasm and in detail. Do you like history? Meteorology? Tales of heroism and tragedy, and the triumph of the human spirit? Buy the book; you’ll enjoy the read. Lynne Tuohy of the Associated Press put out a great story about the storm, the author, and the book; you can find it here (as carried by Newstimes.com). One Response to 75 years ago today: The New England hurricane of 1938 makes landfall. It also drastically reshaped the Long Island Sound. Had Long Island been as developed as it is now, the death toll might have been biblical. On average, a storm follows that approximate path every 75 years. Hence, Sandy.